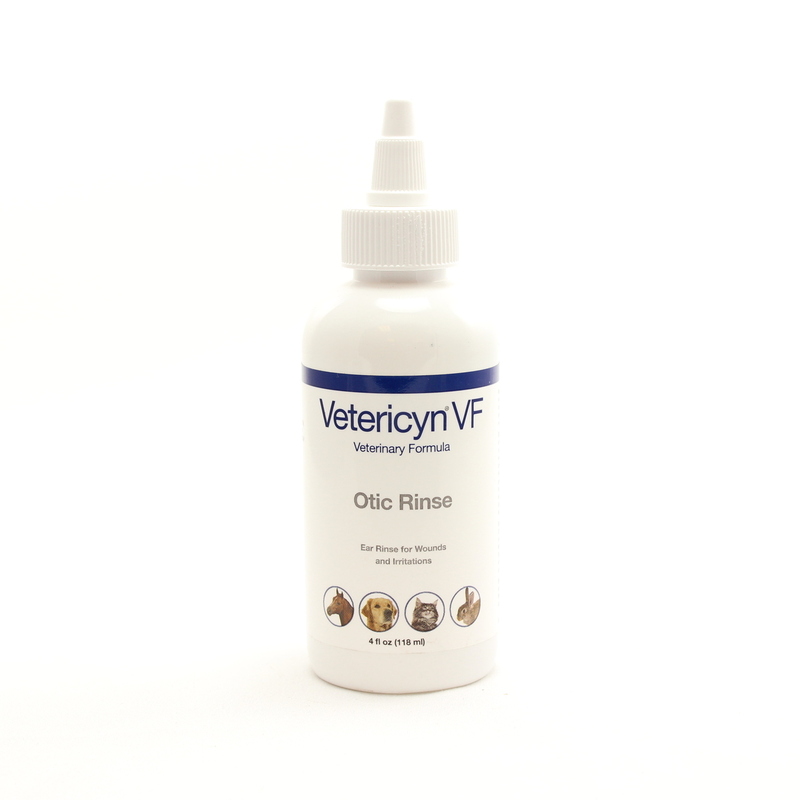 Vetericyn VF Otic Ear Rinse Drops clean and treats ears affected by bacteria, viruses, fungi, contaminants, and pollutants. Apply to the outer ear or ear canal to treat irritations or infections caused by bacteria, single-cell organisms and fungi. This non-toxic, pH neutral rinse contains compounds similar to those produced by the animal's immune system, making it non-irritating and safe if licked or ingested. In laboratory testing, Vetericyn® Otic Rinse kills 99.999% of bacteria, viruses, single-cell organisms, and fungi, making it ideal for prevention and control of infections by killing bacteria such as E.coli, Staph (MRSA), Strep, Moraxella bovis, Pasteurella, Actinomyces, and Pseudomonas aeruginosa. Electrolyzed Water 99.816%, Sodium Chloride 0.023%, Sodium Phosphate 0.15%, Hypochlorous Acid 0.011%. Remove excess hair from affected area and adjust nozzle. Apply Vetericyn liberally on or into the ear canal to clean, treat infections, and promote healing. If dressing is required, apply liberally to each dressing change. Repeat 3-4 times per day until wound is healed or per treatment protocol directed by Veterinarian. No rinsing necessary. Skin may "pinken" after application due to increased blood flow and oxygen to wound site which will help speed healing. Below are some recent questions we've received regarding Vetericyn VF Otic Ear Rinse Drops, including answers from our team. My Cocker spaniel keeps getting a smelly dirty ear. She has had lots of antibiotics and steroids which clear it up for a few weeks then it's back again. I used these drops for a few weeks , seemed to be helping, so I reduced it to twice a week, her ears are sore again, should I use this every day indefinitely? These drops do appear to be very safe, but I am not aware of any studies to investigate their daily use long-term. I feel that you should be safe to do this, but you would have to watch out for any signs of deterioration or discomfort. If they prove effective that way, they might well be justified on the basis that your dog is healthier and more comfortable on them than off. You should check with your vet what they think about this too. I would add that Spaniels are very prone to this sort of recurrent ear condition. Quite often there is an allergic factor underlying it, though their anatomy plays a part in the further development of trouble once it starts. Many of these dogs will respond well to an exclusion diet, so if you get them onto a diet which does not have this effect, the ear trouble clears up permanently. I would suggest talking to your vet about this too, but simply feeding a diet such as Purina HA (and no other foods for a while) can prove effective in itself, without any further topical treatment for the ears.